Girivalam is a religious vow undertaken to circumnavigate the hills having temples. This is an age-old practice of Sanatana Dharma. In the South, devotees perform girivalam of hills like Tiruvannamalai, Thiruparankunram etc. In the North, Govardhan Parikrama is popular. Thus, Girivalam is performed frequently all over our country. The Shiva temple on Parvata Malai is the abode of Sri. 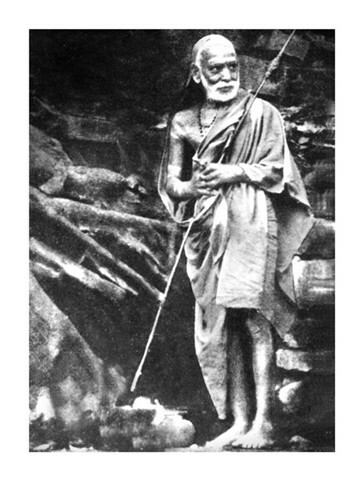 Mallikarjuna Swamy. 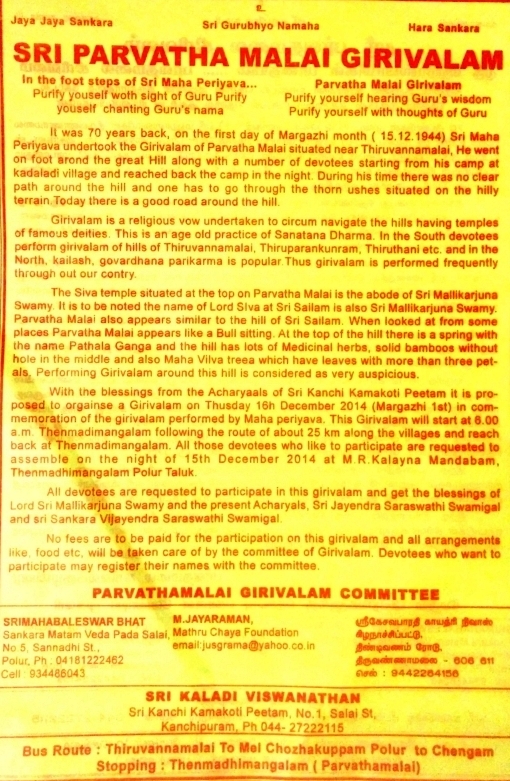 With the blessings of Pujyasri Shankaracharya Swamijis of Sri Kanchi Kamakoti Peetam, it is proposed to organize a Girivalam on Thursday, the 16th December 2014 (Margazhi 1st) in commemoration of the Girivalam performed by Pujyasri Mahaswamiji 70 years back, on the first day of Margazhi month (15.12.1944).He went on foot around the great Hill along with a number of devotees starting from his camp at Kadaladi village and reached back the camp in the night. A similar parikrama was organized last year and earlier years. This year, Girivalam will start at 6.00 AM on 16 Dec .from Thenmadimangalam following the route of about 25 Km along the villages and reach back at Thenmadimangalam. 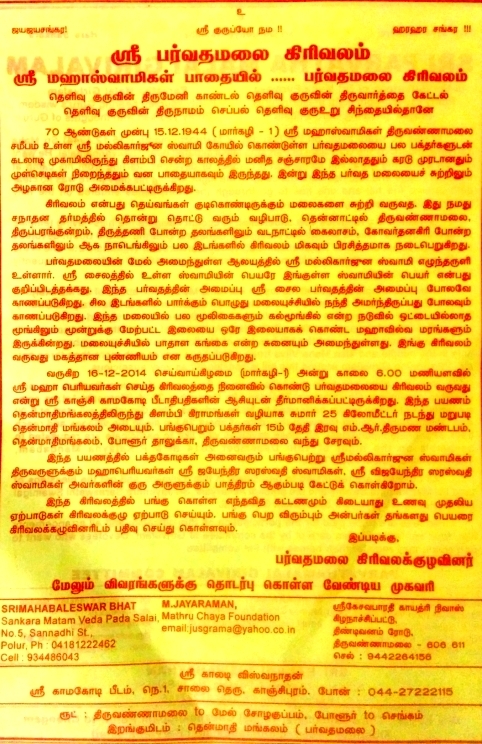 All those devotees who like to participate are requested to assemble on the night of 15th December 2014 at M.R.Kalayana Mandabam, Thenmadhimangalam Polur Taluk. Devotees are requested to participate in this girivalam and get the blessings of Lord Sri Mallikarjuna Swamy and blessings of Pujyasri Shankaracharya Swamijis. No fees are to be paid for the participation on this girivalam and all arrangements like, food etc. will be taken care of by the committee of Girivalam. Devotees who want to participate may register their names with the committee.